ENLARGE for a better view (keep enlarging). 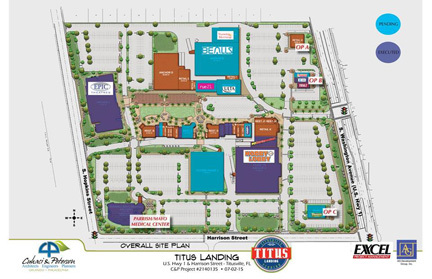 Titus Landing, with its lifestyle center concept, is the location for retail along the Space Coast in East Central Florida. Featuring live festivities, dining, a variety of specialty stores, and the prestigious PARRISH/MAYO Medical Center � along with a view across the Indian River Lagoon of the Kennedy Space Center launching over 20 commercial and NASA rockets annually � Titus Landing will become the entertainment and retail destination for area residents and approximately 3 million tourists visiting America's Space Coast annually. Within the 125 square mile Titusville trade area (an elongated corridor bordered by I-95 and the Atlantic Ocean), there is a population base of 155,000, contained in approximately 67,400 households, with an average household income of $70,489, and a median household income of $53,061. At the mall site, traffic counts on U.S. Hwy 1 are 24,170 daily with future traffic of 56,000 vpd with the project development. Good Morning, North Brevard shoppers! 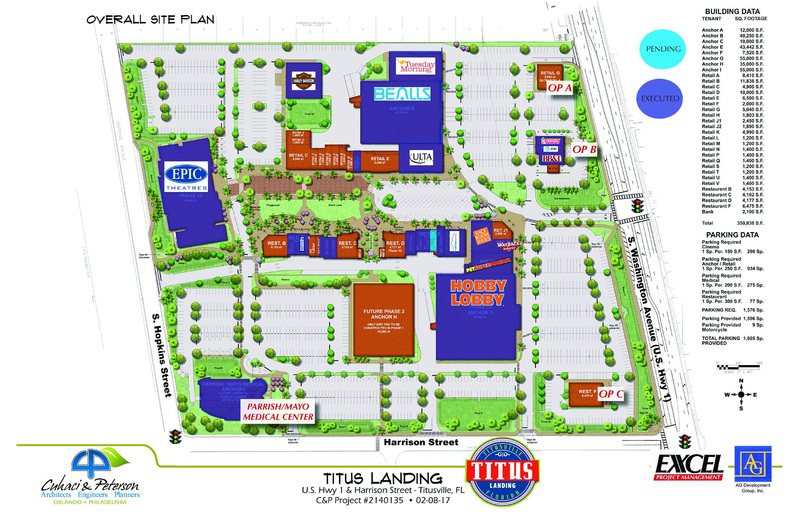 We are pleased to announce the Grand Opening of our first retail anchor, Hobby Lobby, at Titus Landing! Please come and show support to Hobby Lobby and welcome them to the Titusville neighborhood! Thank you! Titus Landing is under construction! A $60 million, 355,000 sf Life Style Center is now funded and will be the future Cornerstone to Titusville! 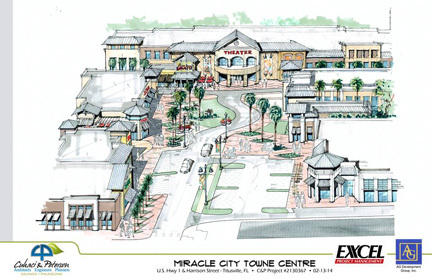 The Towne Square has been retained as the integral part of the Life Style Center that will also feature the 12 Plex Theatre.